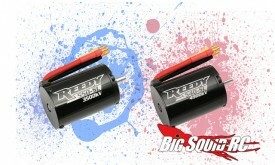 Reedy 540-SL/550-SL Sensorless Brushless Motors « Big Squid RC – RC Car and Truck News, Reviews, Videos, and More! Reedy has a couple new 540-SL and 550-SL Sensorless Brushless Motors to give your 1/10 scale car or truck a little more get-up-and-go! The 540-SL has a 2-pole rotor and 1/8″ steel shaft, while the 550-SL has a 4-pole rotor and 5mm shaft. All are sensorless, with triple-insulated windings and 3.5mm bullet style connectors. The 540-SL is available in 3300kV, 3900kV, 4900kV, and 6100kV. The 550-SL is available in 3500kV, 4000kV, and 4400kV. Be sure to hit up Reedy for more info.